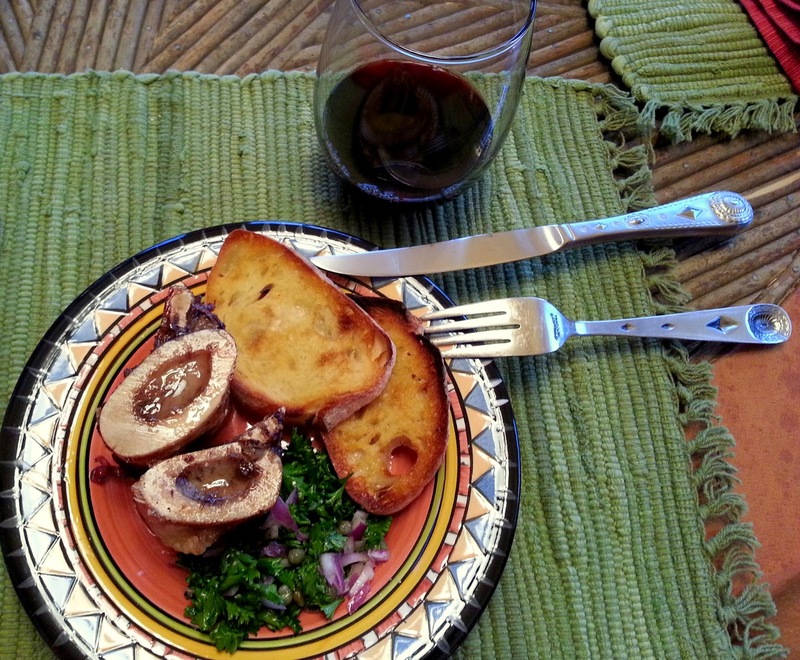 Thanks to my friend Duncan Blair of Rio Santa Cruz Ranch who provided me with this fabulous treat, I had the opportunity to cook my first Marrow Bones. I have had them before in restaurants and loved them, but never cooked them myself. I seem to be in a bit of a meat kick, but that again is, in large part, due to my introduction to grass finished beef. Now I have to find a source for organically and humanely raised chicken and pigs. If you're interested in buying grass finished beef, go to: www.riosantacruzgrassfedbeef.com and place your order! You won't be disappointed! I did a little research to figure out how to cook them and found a wonderful recipe from Fergus Henderson, London chef--someone I am very interested in learning more from. 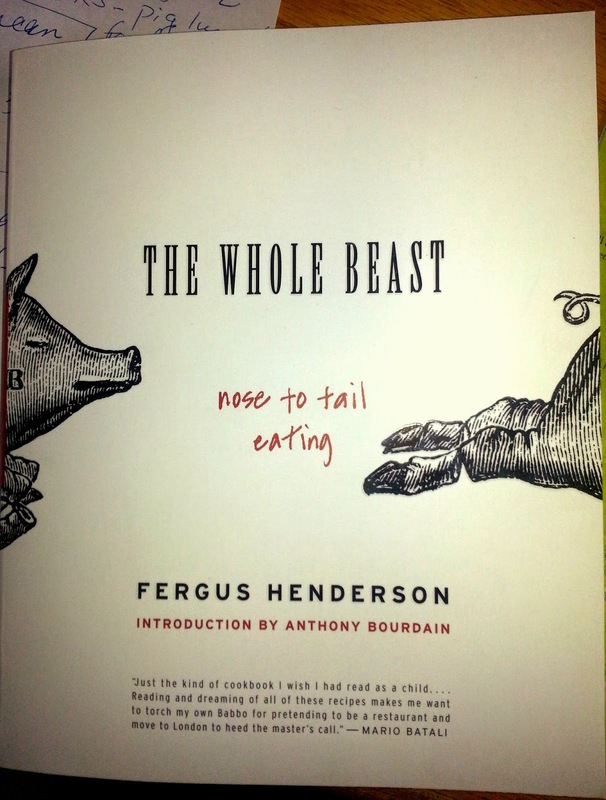 I just picked up his cookbook, The Whole Beast-Nose to Tail Eating. Learning how to utilize every part of the critter is important to me and this chef has obviously mastered that art. The book is brilliant and also includes many more traditional recipes, although I am excited to try the "Pea and Pigs Ear Soup" and the "Lamb's Brain Terrine." These may not be every day fare, but you'd be surprised how delicious these underutilized cuts could be. 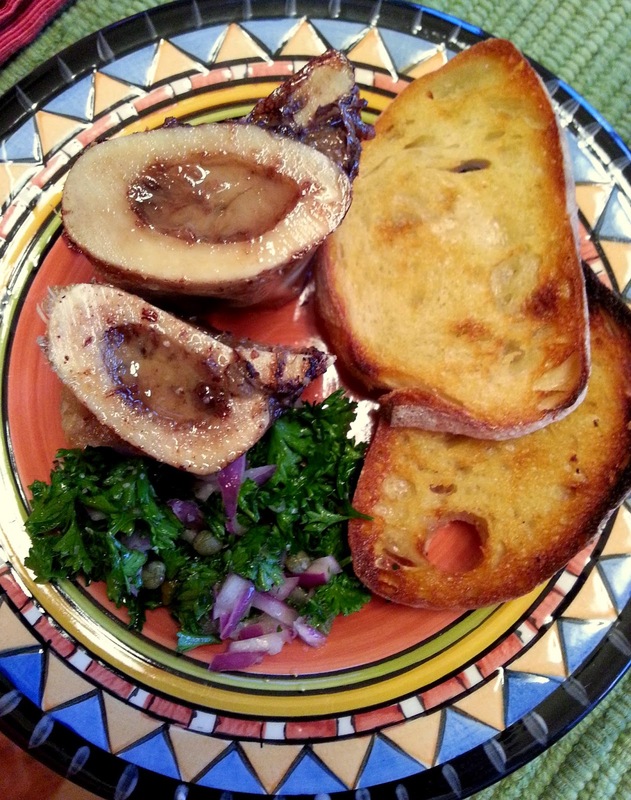 Cooking Marrow Bones really could not be easier. Heat oven to 450 degrees. 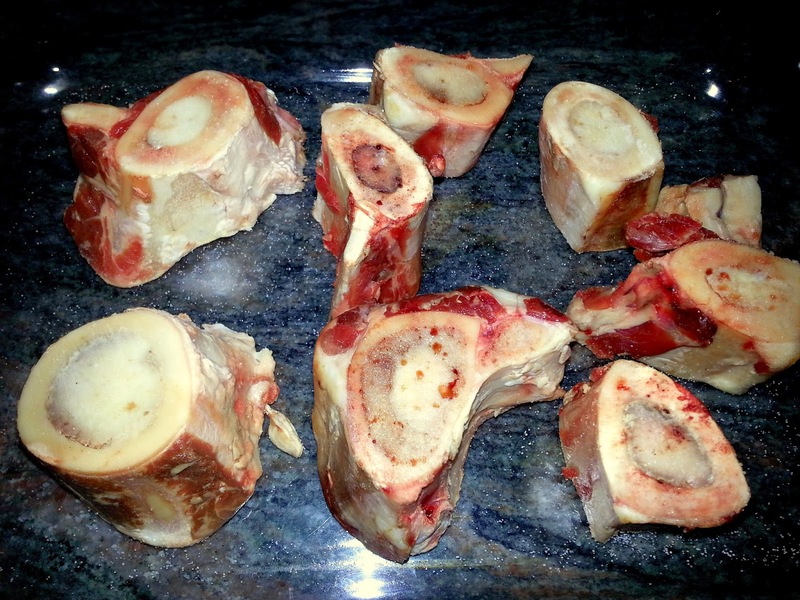 Place the Marrow Bones on a baking sheet. Roast for about 20 minutes. The time depends on the thickness of your bones. As Fergus says, "the marrow should be loose and giving, but not melted away". Make the Parsley Salad while the bones are roasting. Chop a bunch of flat leaf parsley (I had curly on hand so used that instead), mix in 2 Tbsp. capers, 2 finely diced shallot. Just before serving dress with the juice of a lemon, olive oil, sea salt and freshly ground black pepper. 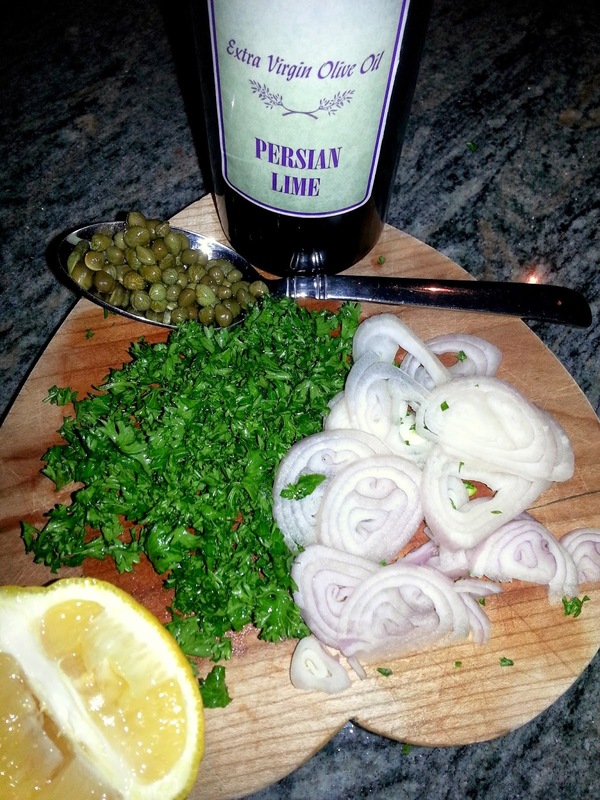 I used this Persian Lime Oil from a little shop in Sonoita, AZ--Skye Island Olive & Grapes. This store offers a "tasting room" with many different flavors of olive oil and balsamic vinegars, plus a nice collection of gifty foods.(http://skyeislandoliveandgrapes.com/). The Lime Olive Oil is delicious, but the flavor may have been a bit aggressive for this purpose. Next time I used regular Extra Virgin Olive Oil and the salad was much better. Slice either sourdough or a nice French bread and grill or pan fry in a little butter. I served as an appetizer allowing each diner to spread the marrow on their toast, top with a little sea salt and then the parsley salad. The second time I cooked the bones was with my good friends Dennis and Diana. 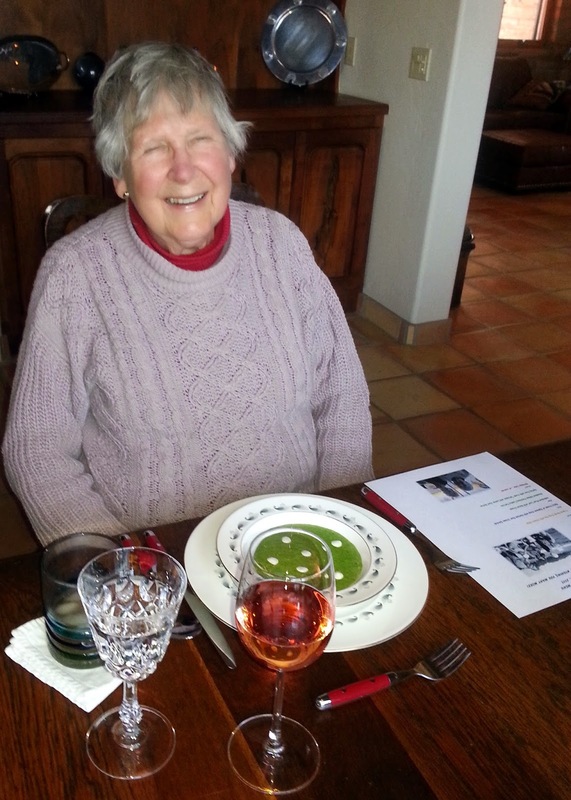 They had never had marrow and both really enjoyed! Very fun adventure! In addition to many a fabulous dinner party, we've shared lots of other adventures with Dennis Diana. Here we are Hot Air Ballooning at dawn over the Tortolita Mountains in Arizona. 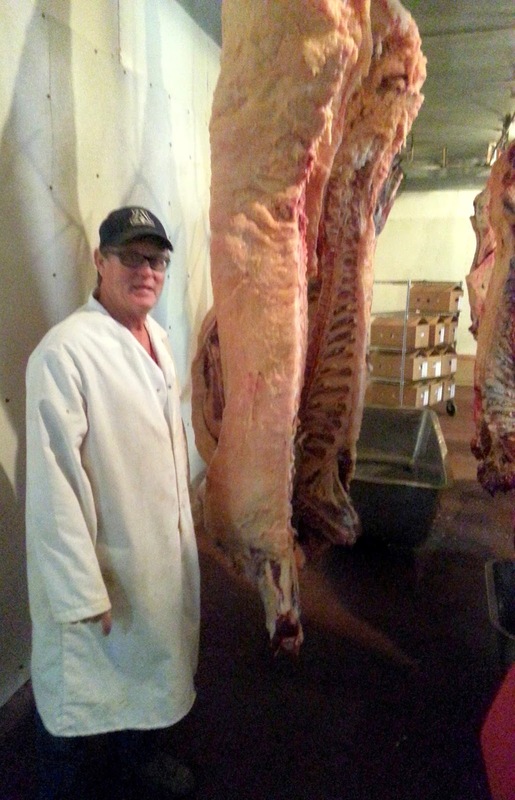 A few weeks back my new rancher friend, Duncan, took me and my husband to the Willcox Meat Packing House in Willcox, AZ to meet owner Kirk Harris and see their operation. We had never been to a commercial plant like this and it was truly fascinating. Kirk is a gentle, soft spoken man who generously shared his knowledge (which is vast!) of how animals are killed and butchered. I know this would not be for everyone, but 'butchering' is another interest of mine and Kirk helped me to understand just how much is involved. Kirk Harris with a cow that had just been slaughtered before we arrived. Willcox Meat Packing is an old family business and we were fortunate enough to meet 3 generations of Harris's. Kirk explained that they are a relatively small operation, slaughtering about 3000 cows per year, but also handle goats, sheep, pigs and wild game. 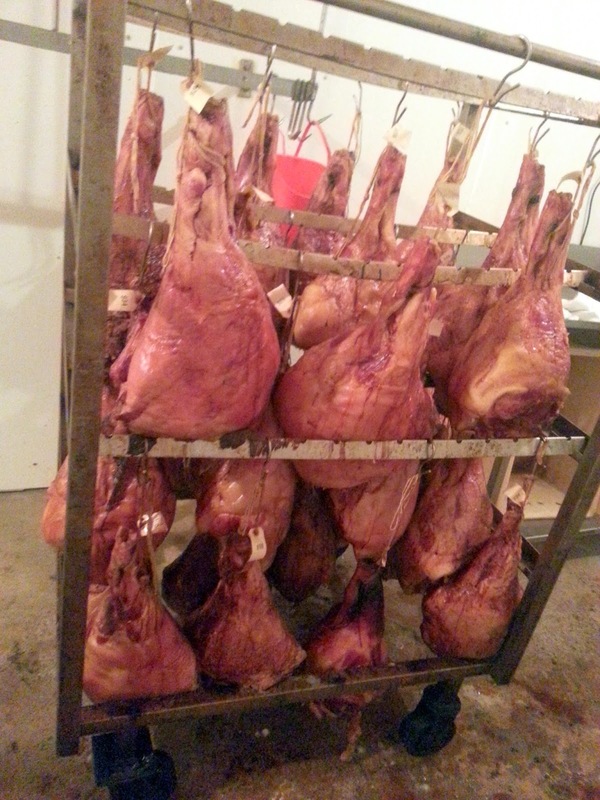 They have started mesquite smoking hams and also make their own mesquite smoked bacon and sausage. It was so smoky in the 'smoke-house' that my eyes watered, but the aromas were wonderful! 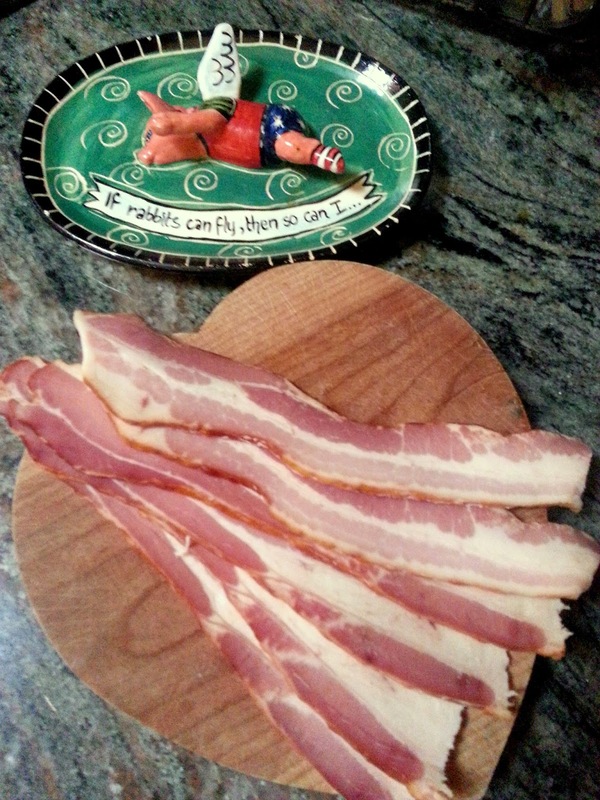 The Mesquite Smoked Bacon is like none I have ever had...thick cut, smoky, but not overpowering and unlike store-bought bacon, it tastes like pork! They don't have a website, but here is their address: 3266 N Fort Grant Rd, Willcox, AZ 85643; 520-384-2015. If you call, please tell him 'Cook with Cindy' sent you! I am trying their sausage next and have no doubt it will be equally special and delicious! 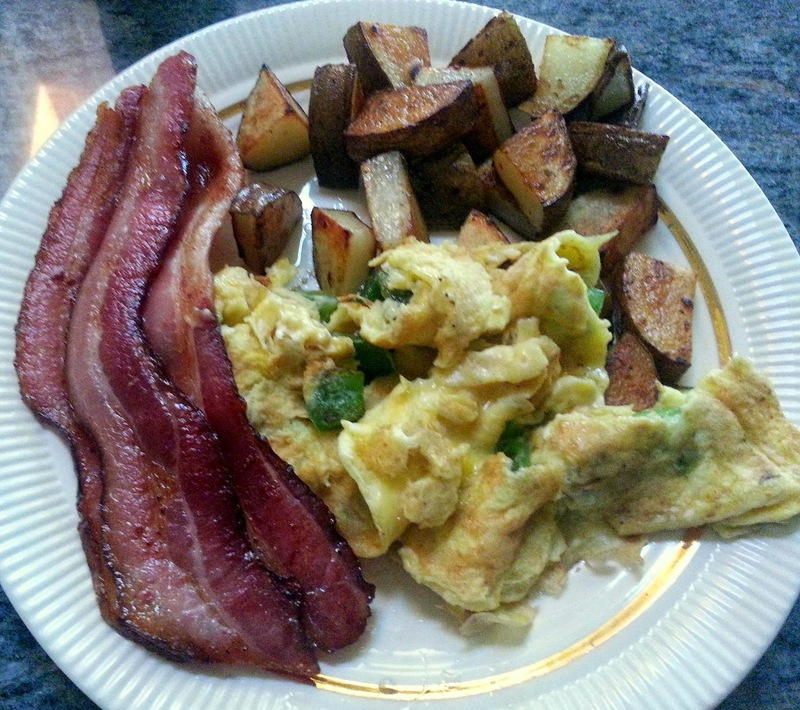 My husband's favorite breakfast: Scrambled Eggs with Green Peppers, very crispy potatoes and BACON! 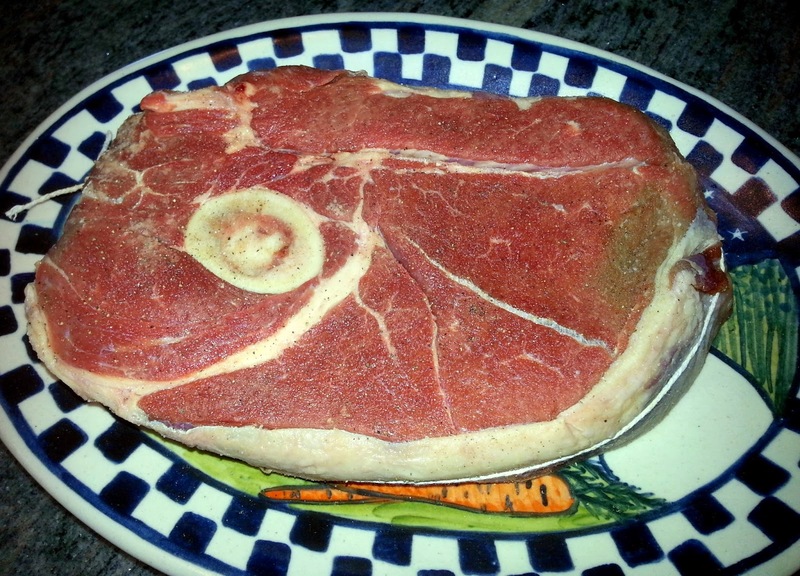 Next, I'm going to share a recipe for Arm Roast, another of Duncan's grass fed cuts. This recipe would work well with any roast or meat that requires braising--slow cooking at low temp. Preheat oven to 300 degrees. My Arm Roast was not thickly cut (about 2 3/4") and looked like it might fall apart after a long, slow cook so I started by tying some kitchen string around the perimeter of the beef to hold it into place. Next, liberally salt and pepper and coat with flour. The flour is what helps thicken the "gravy". Heat 4 Tbsp. of olive oil in a roasting pan until it's nearly smoking. Brown both sides of meat. When nicely browned, remove the meat to a platter. To the same pan, add carrots, onions, celery, and leek. Stir up any browned bits and cook veg for about 10 minutes. Add 1/2 bottle red wine and simmer until reduced by half, about 15 minutes. Add chicken stock and simmer for another 10 minutes. 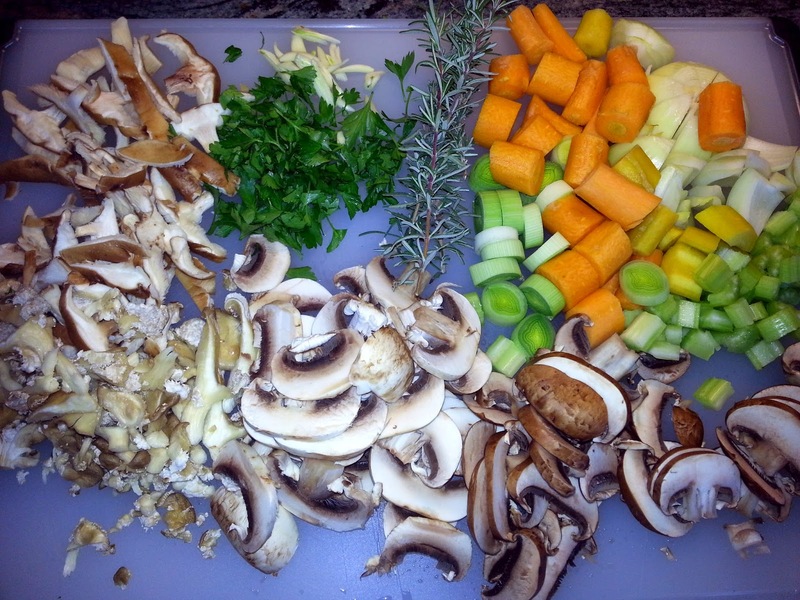 Now add all your mushrooms, garlic, and herbs to the roasting pan. Stir to combine. Place the meat in the roasting pan and cover pan. Put in oven for 1 hour. Check in about a half hour to make sure liquid has not reduced too much. You want it at least half way up the meat. Add more chicken stock/red wine if necessary. Cover again and cook for another 2 hours continuing to check level of liquid. Uncover for last 1 1/2 to 2 hours of cooking. Spoon pan juices over meat every 20 minutes or so. Check to make sure the meat is nearly falling apart. If it is not, cook longer. The size of your roast will determine the length of cooking time. Bigger the roast, more the cooking. 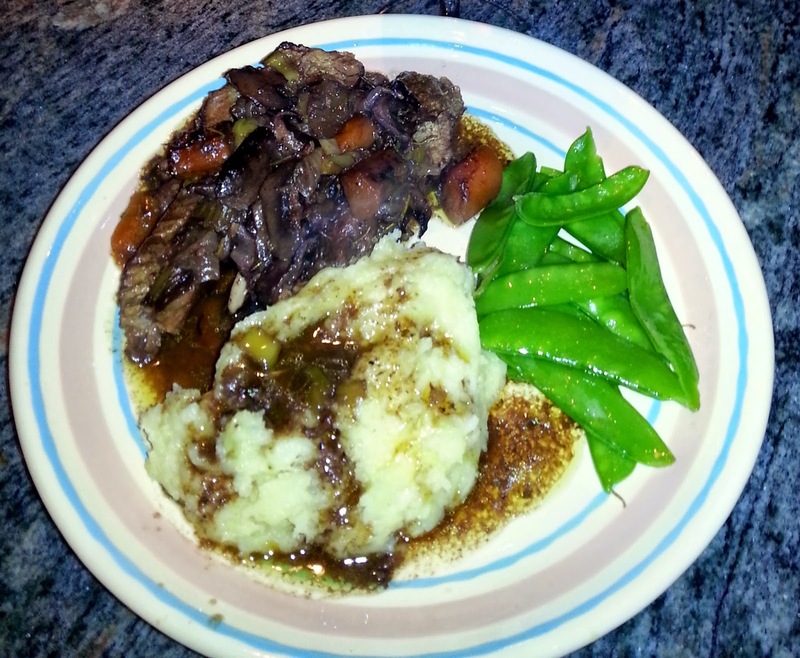 The mushrooms combined with wine and herbs made this a very rich and satisfying gravy. The meat was fantastically flavorful and tender! 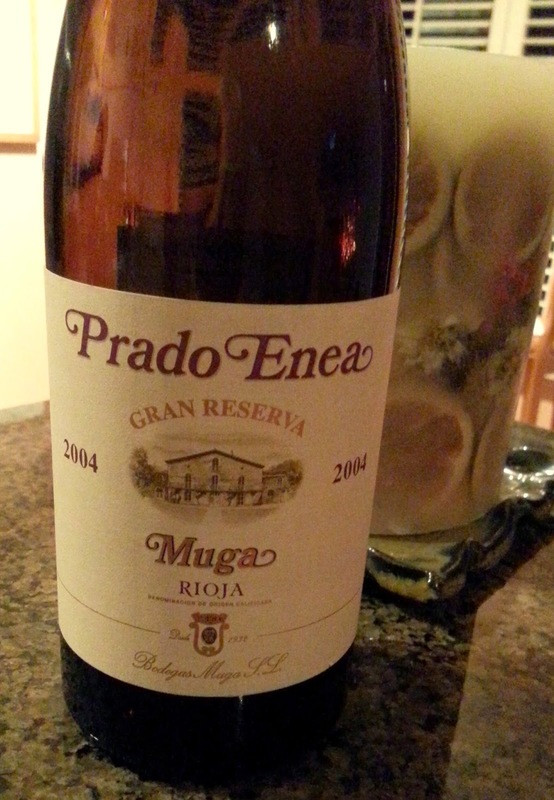 a very special pasta imported from Italy, and the best red wine I have ever tasted--Prada Enea (2004 Muga). MEAT AND POTATOES GET AN UPGRADE! 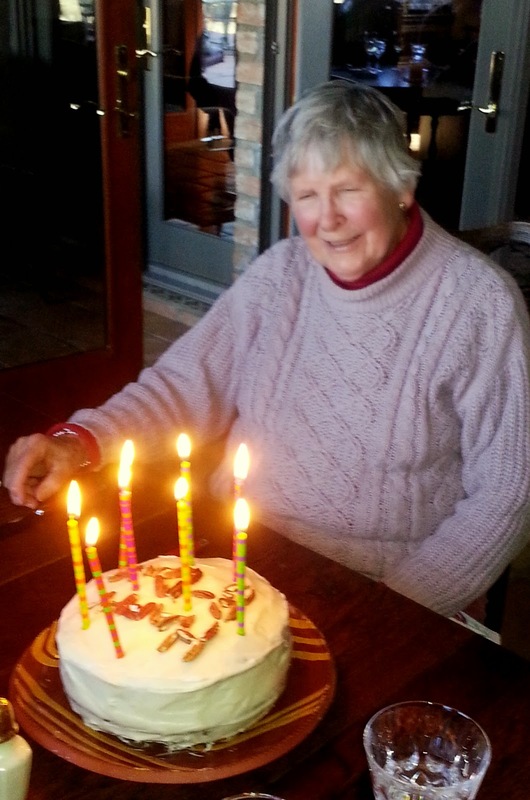 My good friend Paula's Mom, Betty recently had a birthday. I love birthday celebrations so we had a party in her honor. I know she's a meat and potatoes gal, but wanted to do something a bit more special. out the B-Day message. Very clever, Paula! Paula made a fabulously moist and delicious carrot cake for dessert (can't wait to get that recipe! ), but let's start with dinner. Our meal began with a bright, refreshing Spinach Soup...recipe courtesy of my friend Bonnie by way of Ree Drummond. Easy to put together and a perfect way to begin. This soup has quite a kick so if you want to tame it down, just use less cayenne. It can be made a day ahead and is good cold, too. In a large skillet heat the olive oil over medium heat. Add spinach and garlic and cook, stirring constantly, until the spinach wilts, about 3 minutes. Add the mixture to a blender, pour in 1/2 cup hot water and pulse until pureed. Set aside. In a large soup pot, cook the onions in the butter over medium heat until onions begin to soften. 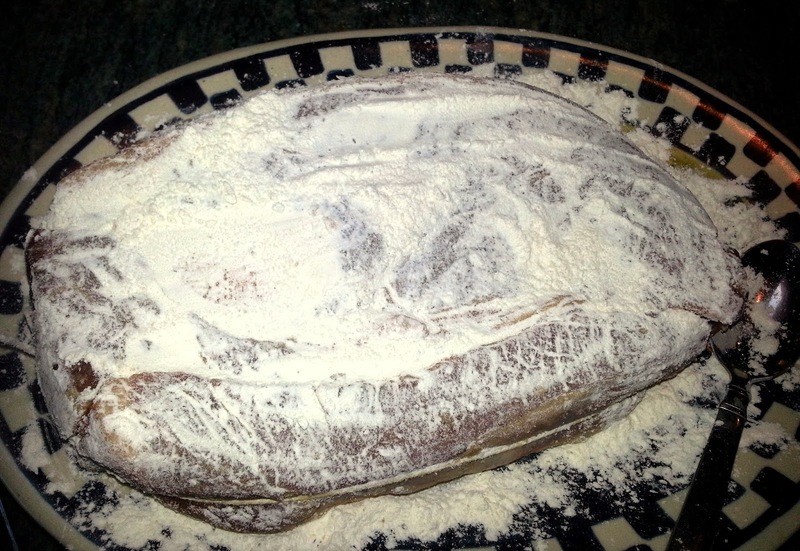 Sprinkle the flour over the top and stir to combine. Cook the roux for about 2 minutes, then pour in milk, stirring occasionally. Season with salt and pepper(s). Pour into the pureed spinach, then cook until thickened, another 5 minutes or longer if you want it thicker. 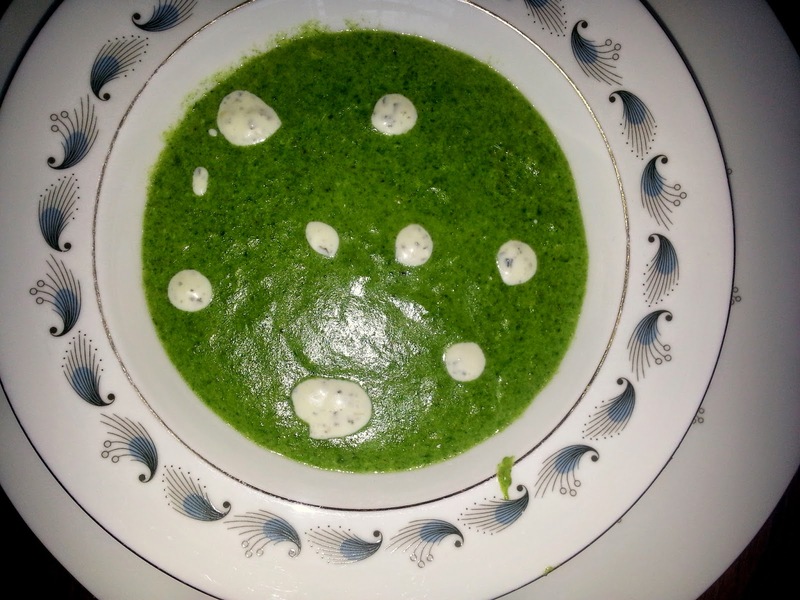 I garnished the Spinach Soup with little drops of sour cream mixed with minced tarragon. For this recipe I used ground beef from Duncan and Susan Blair's Rio Santa Cruz Ranch here in Arizona. (http://www.riosantacruzgrassfedbeef.com/ ). I doubled this recipe and it came out just fine, but here is the original which serves 4. Put oven rack in middle of oven and preheat to 400 degrees. Line a shallow baking pan with foil. Cook onion and garlic in oil in a skillet over moderate heat, stirring frequently, until just softened, about 4-5 minutes. Stir together bread crumbs, milk, eggs, parsley, Worcestershire sauce, Tabasco, salt/pepper in a large bowl. Gently combine meat mixture, then add to bread crumb mixture along with onion. Using your hands gently knead until just combined. Mixture will be fairly moist. Using a 1 cup measure, drop slightly rounded cups of mixture onto the baking sheet and lightly pat to form 4 domes. Stir together ketchup and vinegar and spoon over mounds. Bake meatloaves about 25 minutes (meat thermometer reads 155F). While meatloaves are baking, cook bacon in skillet over moderate heat, stirring occasionally, until crisp, about 7 minutes. Transfer with a slotted spoon to paper towels to drain. 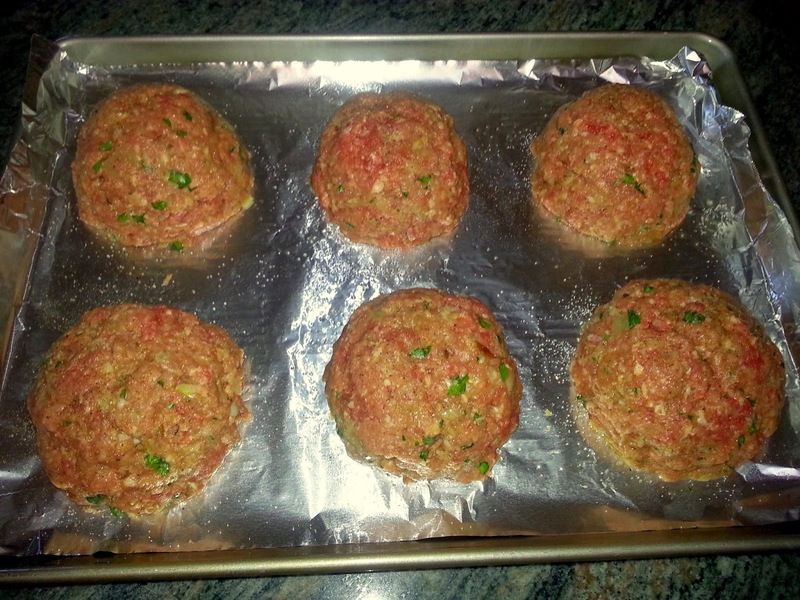 After meatloaves have baked, remove from oven and turn on broiler. Broil meatloaves 2 to 3 inches form heat until glaze is slightly caramelized. Watch carefully as all that sugar in the ketchup can "catch" quickly. 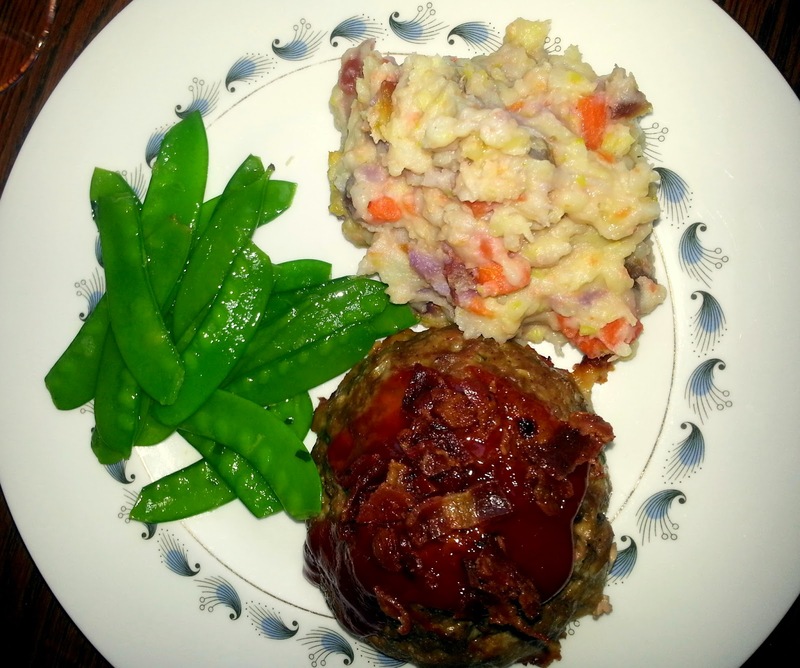 With the (not so little) Individual Meatloaves I served an interesting twist on mashed potatoes and a slightly different variation of peas, which in our household growing up, always accompanied meatloaf, but were usually frozen or canned. 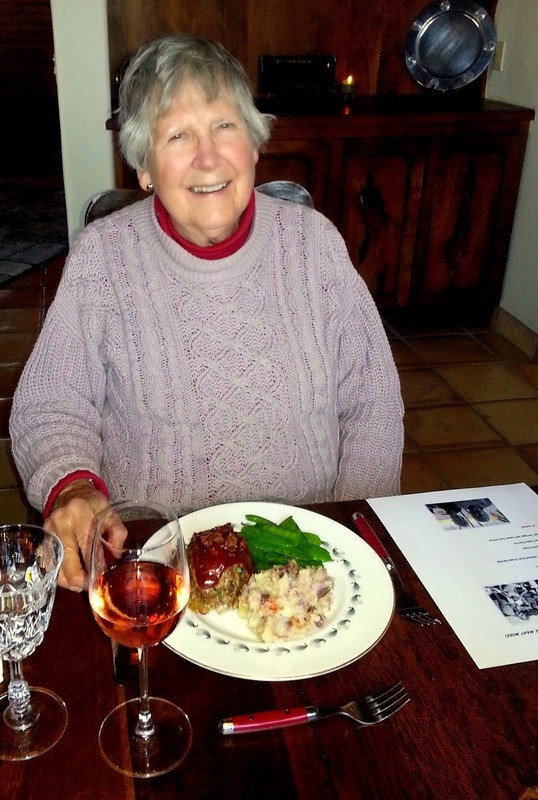 Betty is a fantastic dinner guest!...great conversationalist and ate everything on her plate! Wash chopped leek well in a bowl of cold water. Leeks hold their dirt so you really need to scrub them. Drain well. Peel potatoes and cut into 2 inch pieces. Cover with cold water in a saucepan and bring to boil. Reduce heat and simmer until potatoes are very tender, about 18-20 minutes. Drain and return potatoes to saucepan. While potatoes are simmering, cook carrots in a saucepan of boiling salted water until just tender, about 5-6 minutes, then drain. Cook leek in butter in a medium skillet over moderate heat, stirring occasionally until very tender, about 6 minutes. Add milk, salt, pepper and simmer stirring for 2 minutes. Add leek mixture to potatoes. Coarsely mash with a potato masher, then stir in carrots. I really liked the look of the colored carrots with the potatoes and all the flavors came through beautifully. Stir together butter, zest, tarragon, salt, pepper. Cook snow peas in a steamer basket until crisp-tender, about 2 minutes. Drain well. Transfer hot snow peas to a bowl and mix in lemon herb butter. Toss to coat. That's going to do it for today's special birthday meal. HAPPY BIRTHDAY all over again Betty Ann! I am very excited to share with you next time, another cut from the Rio Santa Cruz Ranch... ARM ROAST! I had never heard of Arm Roast, but it is exactly what you'd think...a relatively thin (in roast terms) cut from the upper front leg (arm) of the cow. 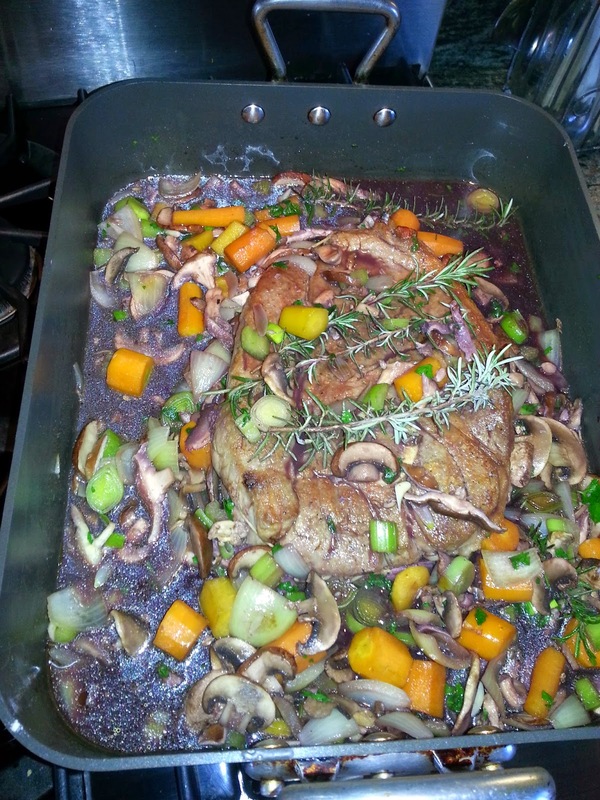 It's a cut you want to slow roast and I braised with wild mushrooms and reduced red wine sauce...Yummy! Next time, I'm also going to share a very special visit, with behind the scenes shots, I had with a local Arizona butcher! 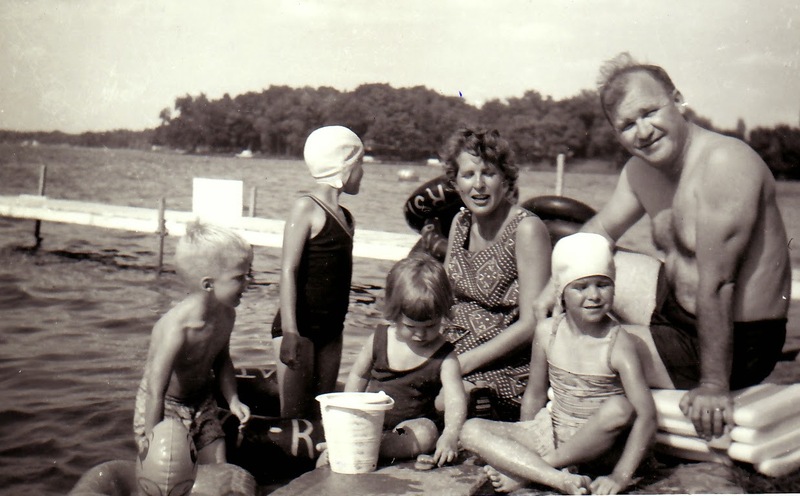 Here's a shot of Betty and her family from 1965. My friend Paula will be born later that year!